Potatoes are full of possibilities. You can bake them or cut them and make fries, wedges or homemade chips. You can shred them and make hash browns or mash them and make homemade mashed potatoes. Matthew’s favorite way to prepare potatoes is to roast them in a stovetop pan. It’s also a favorite of Molly’s mom, who requests the potatoes at nearly every family gathering. The great thing about this recipe is that you can follow all of the steps until you put the potatoes in the pan and then mash the potatoes, add milk or cream and butter and have delicious homemade mashed potatoes. This recipe can incorporate your favorite potato, Idaho, red or otherwise, and you can also bake the potatoes in the oven, instead of cooking them in a pan. Cut your potatoes. The smaller the potatoes, the faster they will cook in all stages of this recipe. 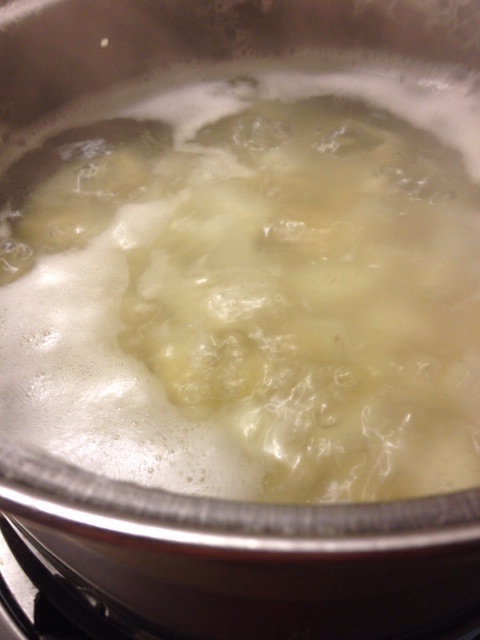 Boil your potatoes in a pot on the stove until the potatoes are fork-tender. You can boil the potatoes in a microwave, but it will take much longer. 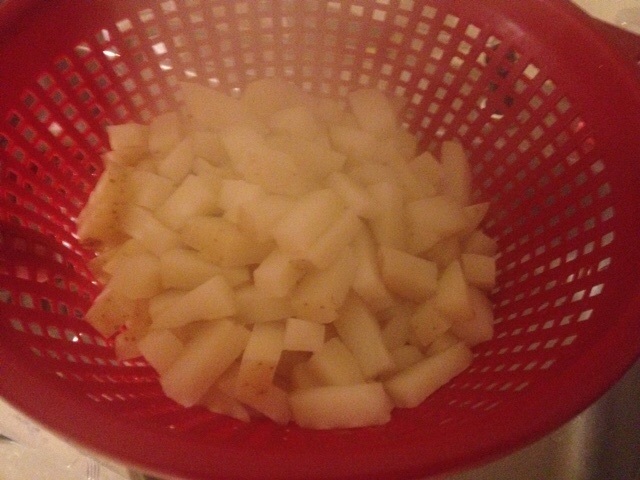 Drain your potatoes in a colander or around your pot lid over a sink, being careful to keep your potatoes in the pot. Turn your burner to medium-high heat and put your potatoes in the pan on the stovetop. 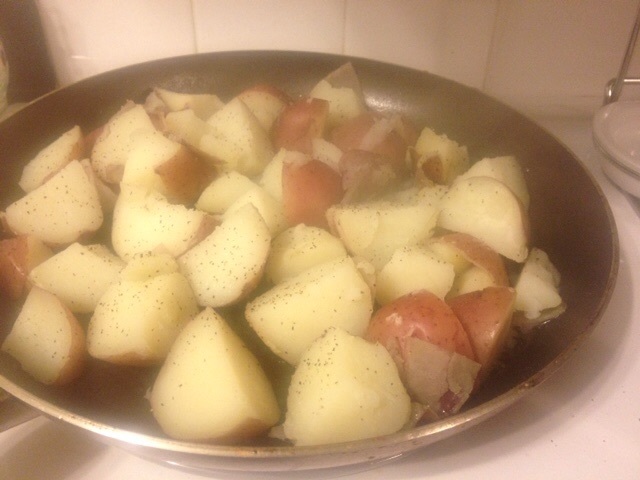 Cover your potatoes with a light coating of olive oil (or vegetable oil if that’s all you have). Top with a sprinkling of salt and pepper to your desired taste. Let your potatoes roast until you start to see sides browning, then take a spatula to mix the potatoes and move them to position them for browning on other sides. Reduce your heat to low and cover your pan with a lid to allow your potatoes to steam and thoroughly cook. You will get a slight browning on the potatoes while they are covered, too, but this part of the process is mostly to soften and moisten the potatoes after you’ve just browned them in the pan. The browning process can remove much of the moisture in the potatoes, and the roasting process with the lid on helps replace that moisture. Remove your potatoes from the pan. It’s not likely you’ll have much grease after roasting the potatoes. Enjoy! Matthew’s Take: Not only is this my favorite method of preparing potatoes, it’s my favorite way to eat potatoes. These go great with burgers, with salmon, with grilled chicken, with fried chicken tenders, with almost anything. If you cut the potatoes into small pieces, they’re a great breakfast potato, and they can even be used as leftovers in breakfast tacos or burritos. They pair great in a tortilla with eggs, bacon or sausage and cheese. These potatoes get an A+ for taste, an A+ for ease, an A for cost as a plain ole bag of potatoes isn’t usually expensive, and they get a B for presentation. You can jazz up the presentation by topping with a little light cheese or carefully ensuring you have the perfect browning on all sides. (You can do that by browning in the pan more than roasting with the lid on, but you may lose some of the moisture.) I hope you enjoy these potatoes as much as we do.